I previously shared the advantages of being upright in the water in order to achieve maximum therapeutic benefit by stimulating the neuro-developmental pathways that support rolling over, crawling, and walking. Being in water deep enough to accommodate one’s height helps accomplish this. Once a toddler or small child has outgrown his or her WaterWayBabies pool or bathtub at home, parents must look to other resources. Many YMCA’s have warm water therapy pools. 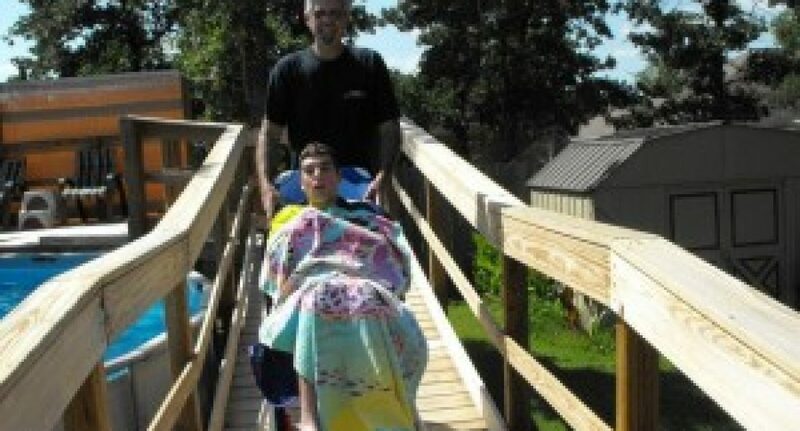 The YMCA accommodates special needs with lifts and ramps, as well as being a convenient and cost-effective option. For more information, go to http://www.ymca.net/find-your-y/. 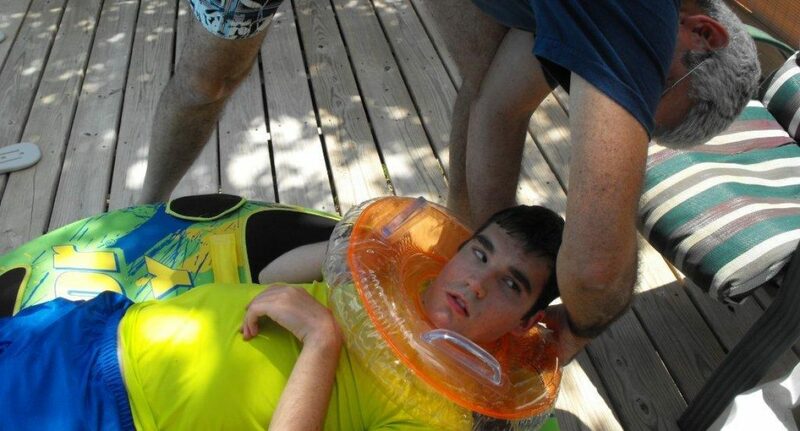 Some YMCA’s are unfamiliar with the neck ring and may ask questions, so take along my ‘Instructions for Use’ and brochure to share with the lifeguard or Aquatics Director. You might have a community-based therapy pool in your community. This is highly individualized from place to place. I know, for example, we have an excellent source here at our Houston, TX, Multi-Service Center. And there is a fabulous place called Lakeshore in Birmingham, AL; TLC4Blind and The Rosebowl Aquatic Center in southern California; and natural spring-fed pools in Colorado and New Zealand… to name a few. I’m sure they are sprinkled across the country and if you will email me yours, I’d love to construct a map as an online resource! I would like to make a WORLD MAP of all such pools that you know of. ? Aside from these options, you might get a bit more adventurous and assertive by asking your local hotel/motel to use their pool during slow traffic times. The water probably won’t be therapeutically warm (92-93*F), but at least, the depth is there. 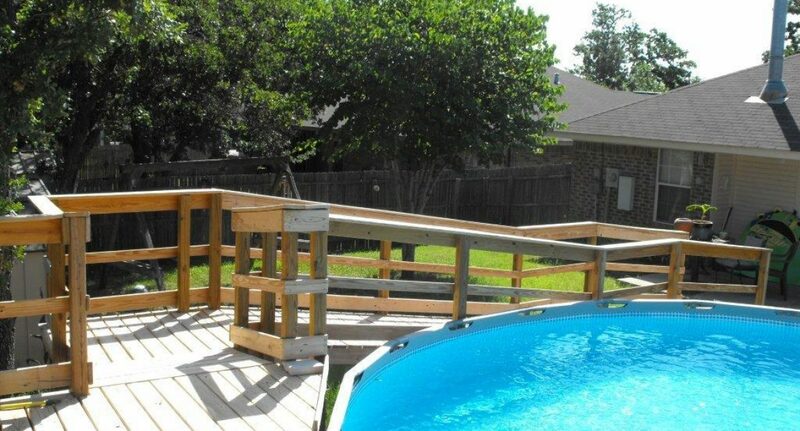 Once parents see how much their special child benefits from and loves the water, more of them than I would have ever imagined actually put a pool in their own backyard. While this might seem complicated and laborious, it can be well worth it. And it does not have to be cost-prohibitive! 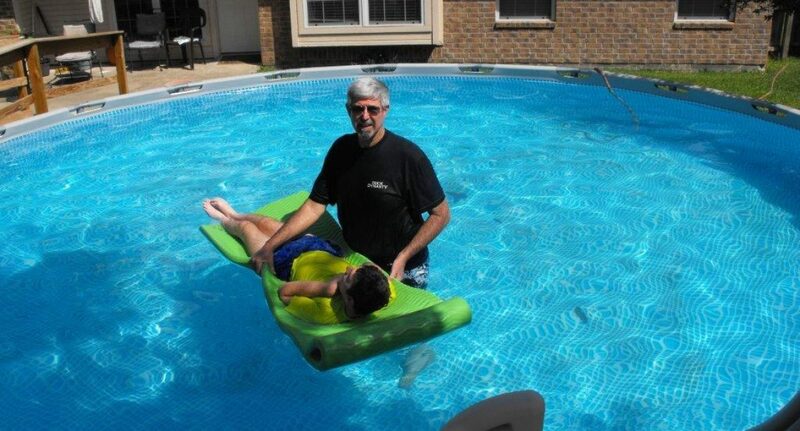 Yes, there is the luxury of an in-ground pool, therapy pool, or swim spa. 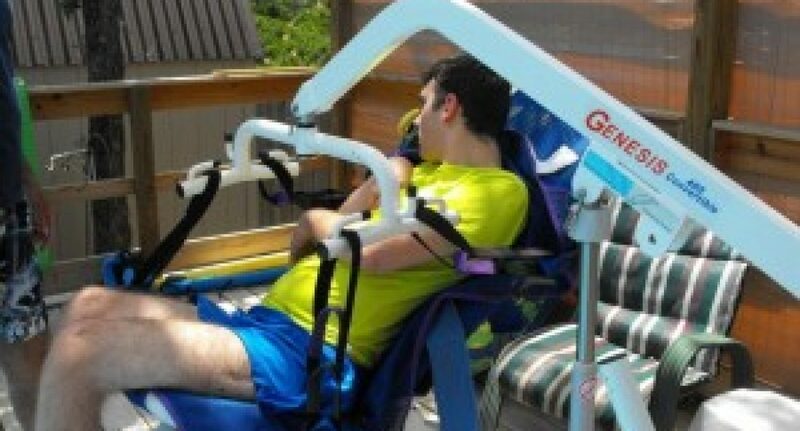 Oftentimes, Make-A-Wish will help with funding. To make a wish for your child, go to http://wish.org/refer-a-child. Patty and Lonnie bought an above ground pool at Wal-Mart. Pools range from $200-2000 (they got theirs when they went on sale in off-season). It is 54 inches tall, which means you would get at least a 4 feet of water depth. 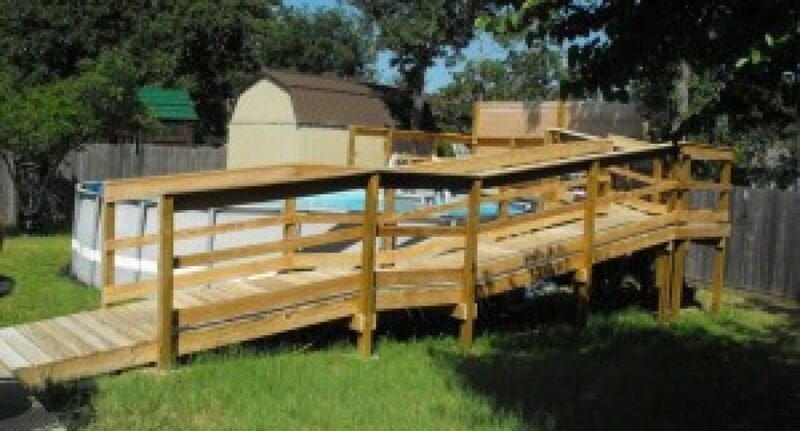 They spent roughly $1900.00 on the materials for a deck and ramp, which Lonnie built so there were no labor costs. A filtration system came with the pool, but they use a chlorine-free “Krystal Clear Saltwater System.” While the water temperature is weather-regulated, a thermal blanket-pool covers will raise the water temperature by several degrees. 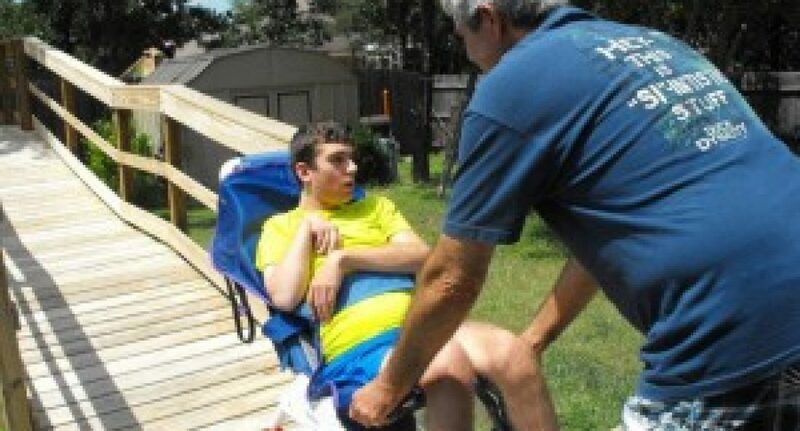 Getting a big guy like Taylor (120 lbs) from a wheelchair into the water takes some doing, but Lonnie and Patty have devised a system that works for them. 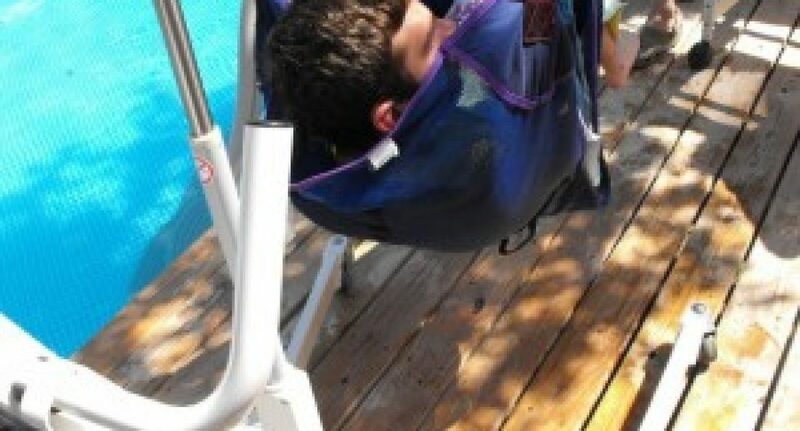 First, they roll Taylor up on a shower chair up to the poolside deck. 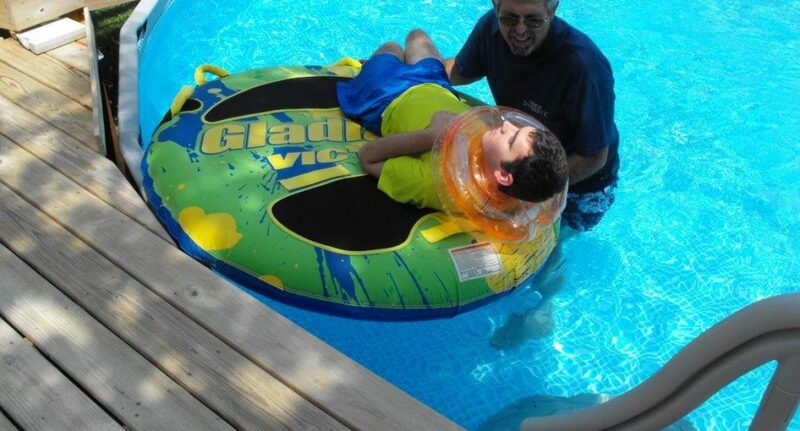 Then, they use a regular Hoyer-type lift to move him out of the chair and onto one of those big inflatable tubes you see pulled behind a boat (see photo below). It is there that they put on his neck ring. 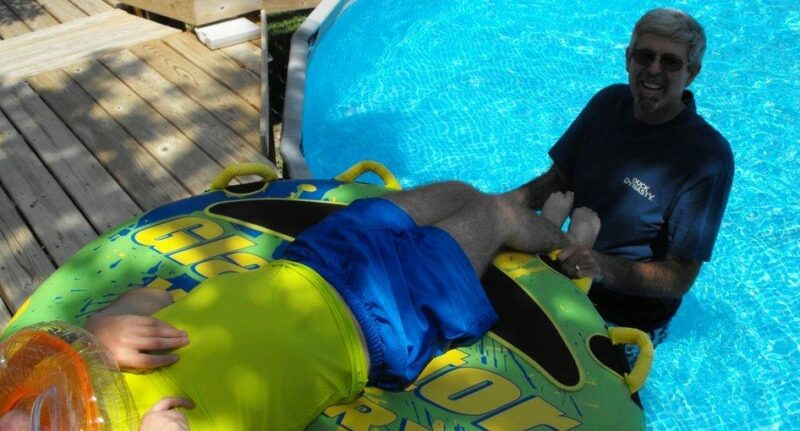 Lonnie then jumps in the water and they slide the tube with Taylor onto it into the pool. 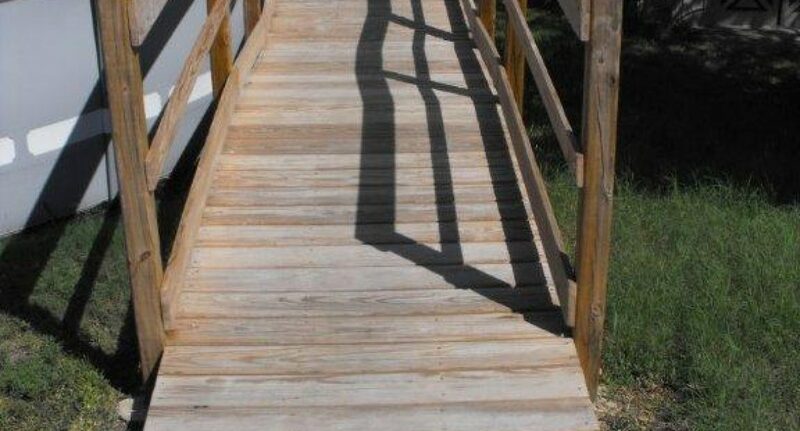 From there, he can be rolled off into the water. 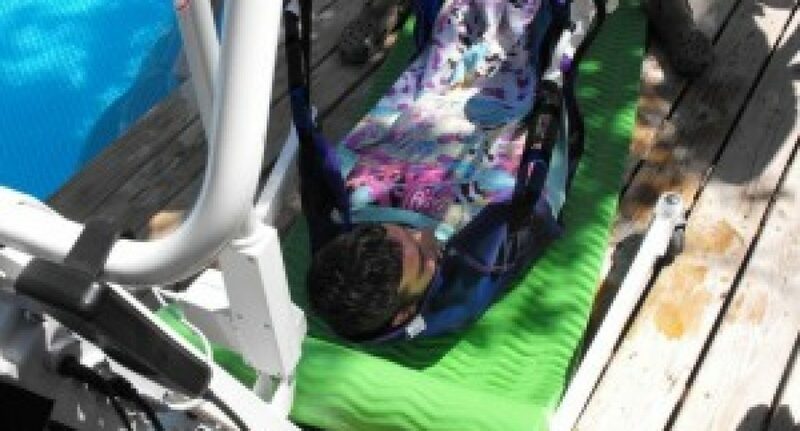 To get Taylor out, they use a thick cell-foam float from Academy that they put under him while he is still in the water. 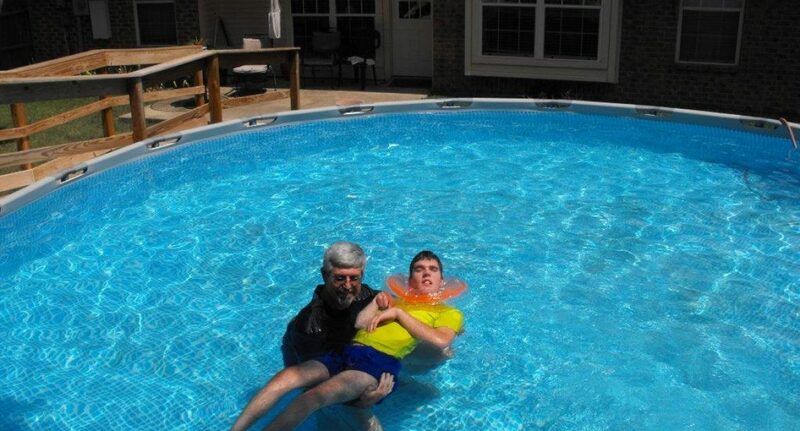 Then Patty gets on the deck and pulls the float and Taylor out with Lonnie lifting from the pool. 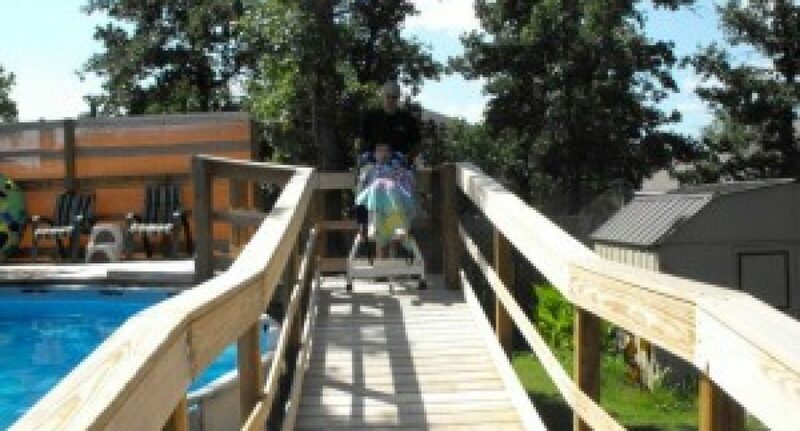 Then, they reverse the steps using the lift to get him from the ground back up onto the shower chair and back in the house. 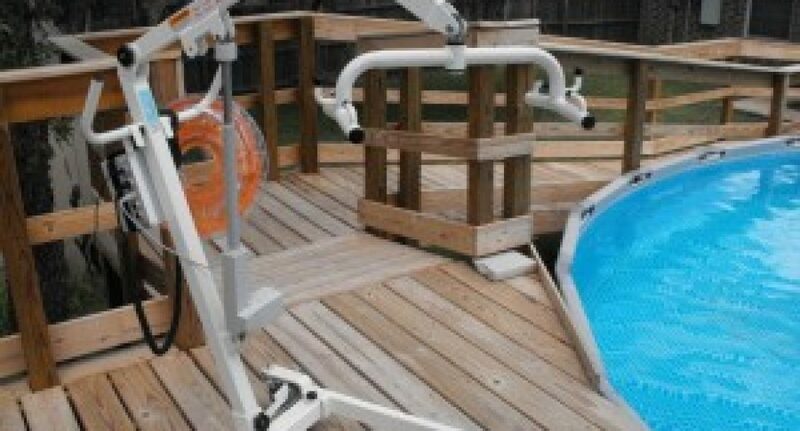 It might sound a bit complicated, but they have found it works for them and is a good alternative to purchasing a much more expensive pool lift. I never cease to be amazed at the level of creativity, drive, and determination you special parents possess when it comes to helping your child! I hope these examples have given you food for thought about different water options as your child grows up.